Almost everyone, at one time or another can use assistance. Whether it is with the essentials of clothing, food, or shelter, or family support services the following resources and community agencies are available, many 24/7. Please work with the CCPS School Social Work staff to offer support and help you obtain the resources you need to bring balance back into your life. Excellence in education begins with strong relationships and partnerships within our academic and social communities. All families have the capacity and desire to actualize the very best outcomes for their child. Families and schools should be equal partners. The responsibility for building and sustaining partnerships between school, home and community rests primarily within the school system. The FACE Place at CTC@Hull welcomes all families and educators, providing resources and professional development to strengthen ties between home and school, families and teachers, and schools with the communities they serve. Chesterfield County Public Library has a wealth of resources such as databases that offer help from homework to test prep. Colorín, Colorado! Is a bilingual site for educators and parents of English language learners. TweenTribune– online newspaper for kids, aged 8–15 that is updated daily with stories relevant to pre-adolescents. Baby Clothes Closet: Diapers & clothes in sizes newborn to 3T; can be picked-up 3 times per year. Open on Tuesdays & Thursdays from 9am – 1pm. Call 285-5900. Mercy Mall is a FREE boutique where families and individuals can shop for clothing, shoes, housewares and baby items. We also give away a few food and toiletry items to each family during their appointment. We are not a monthly or regular “thrift store” experience but rather a place for those in crisis situations to get their immediate needs met. 7800 Salem Church Rd. 271-4018. Clothing for Chesterfield residents only, Walk-ins are welcome. Saturdays: 10—11:30 am. Call 828-9190 or visit https://vcudentalcare.com/practices/student/ for more information. Doctors are specialized to care for patients with early childhood caries, autism, behavioral management, special needs and other medically compromised conditions. The office accepts all patients regardless of dental health insurance coverage (insured and uninsured). There is no cap on Medicaid patients. Phone translation services are available for multilingual access. Accepts Medicaid and most types of insurance. For more information visit https://www.mykoolsmiles.com/ or call Toll Free 866-767-3722. Dental services for FAMIS & FAMIS Plus. 1-888-912-3456. The office accepts all children regardless of dental health insurance coverage (insured and uninsured). There are office personnel who speak Spanish. Or click here to open confidential messaging. The Chesterfield County Domestic and Sexual Violence Resource Center works closely with State, County, and community agencies, serving as the hub of the County’s coordinated community response to domestic and sexual violence. For more information call 804-318-8264 (Client Services) or 804-318-8265 (Administration), or visit our website at http://www.chesterfield.gov/DSVRC/. The GRR hotline is the product of the Regional Collaborative that includes Safe Harbor, the YWCA of Richmond, Hanover Safe Place, the James House and Project Hope at Quin Rivers. Help is available via email in English & Spanish. S. Chesterfield, Tri-Cities, Dinwiddies, Surry, Sussex. The LGBTQ Partner Abuse and Sexual Assault Helpline provides a free and confidential telephone service for lesbian, gay, bisexual, trans, and queer or questioning callers looking for information or help regarding intimate partner abuse, sexual assault, and stalking. Financial assistance, food and career clothes closet. Call between 8:30 a.m.—1:30 pm, Monday— Thursday. Call 796-2749 or visit our website: www.cchasm.org for more information. Emergency Services – Assessment and Resource Team responds to requests for families in crisis, for emergency shelter, financial assistance and conflict resolution and helps meet emergency needs such as utilities, rental assistance, food and medication. You may call 804-748-1100 and ask for an Assessment and Resource Team member. Come during office hours (no appointment necessary) to be screened for services or provided with information about community resources and programs. Energy Assistance Programs call 717-6825 for more information. Call 285-5986, for housing & financial counseling services & classes. For utility & rent/mortgage assistance, holiday assistance call: in Richmond: 225-7470, in Petersburg: 732-8449, in Hopewell: 452-0232. Assistance through any of our programs begins with a call to our client assistance line at 804-796-2749. They are available Mondays through Thursdays, 8:30am – 1:30pm. Our food assistance program is designed to aid individuals and families who have experienced or are experiencing an emergency situation which limits their funds for essential items such as food. It is intended to help stretch and supplement other resources such as WIC and TANF. This emergency assistance also provides interim food items while individuals are waiting on applications for other resources to be processed. Located at 530 Southpark Boulevard, Colonial Heights, VA 23834 and available for families living in the 23834 and 23803 zip codes. Please bring proof of residence and income. On-site distribution occurs Thursdays 6-8pm and Fridays 12-2pm. Please bring proof of residence & income. Call 520-7117 for more information. Distribution occurs at the Dibert Food Pantry on Tuesdays, Wednesdays and Thursdays from 9:00 am – 12:00 pm. Identification is required and recipients may receive food once within a 30-day period. Call 804-285-5986. Referrals are made to local food pantries, call 804-521-2500 for referral details. Hot meals are served Tuesdays through Fridays at our facility located at 2124 Willis Rd, North Chesterfield. Please call 804-293-0201 for more information. Meals are served Mondays through Fridays at 12:00 pm at Broomfield CME Church, 609 Jefferson Davis HWY. Richmond, 225-7470; Tri- cities, 732-8449. Located at 2619 Sherbourne Road and open Wednesdays 9:00 am until 11:00 am, the food pantry serves families living in the 23234 and 23237 zip codes. Call 804-275-6321 for more information. Resources are available for students and families experiencing housing insecurity within the school division. Please click here to learn more about McKinney Vento and supports that you or someone you know could be eligible for. All listings under the Shelters have available case managers to help locate permanent low cost housing. 804-972-0813. Call this number if you are homeless or will lose your housing in the next 3 days. Located at 511 West Grace Street. System Navigation Assistance, Walk-in or call. Monday—Friday, 8:30—5:00 For more information please call: 804 -648-4177. 244 Halifax Street, Petersburg, call 861-0849. They accept only women and female children age 17 and under. Partnership between YWCA/Safe Harbor/Hanover Safe- Place. Women, men & children experiencing DV, sexual violence or intimate partner violence can find shelter & support 24/7. 804-612-6126. For emergency shelter, please call the housing crisis line at 804-972-0813. The shelter is located at 2 West Grace St, richmond, VA 23220. The direct line for the shelter is 804-225-7470. The Housing Choice Voucher Program is a federally funded rent subsidy program which enables low-income families to choose and lease safe, decent, and affordable rental housing. Visit http://www.chesterfield.gov/content2.aspx?id=2732 or call 804-717-6382 to see if they are accepting applications. HOME was founded in 1971 to fight discrimination in housing access. Many of HOME’s victories are well known, setting U.S. Supreme Court precedents and providing national impact. HOME’s mission is to ensure equal access to housing for all people. Visit http://homeofva.org/get-help or call 804-354-0641 for more information. Visit www.VirginiaHousingSearch.com to find affordable housing in your area. When students and/or families find themselves in a place of transition or in temporary housing situations it is often during these times that academic barriers are encountered. Registration, enrollment, transportation and accessing school supplies and/or school sponsored programs may be difficult. For this reason, the McKinney-Vento Act was created. The Act’s purpose is to support school access, school stability and academic success for students residing in transitional living situations. 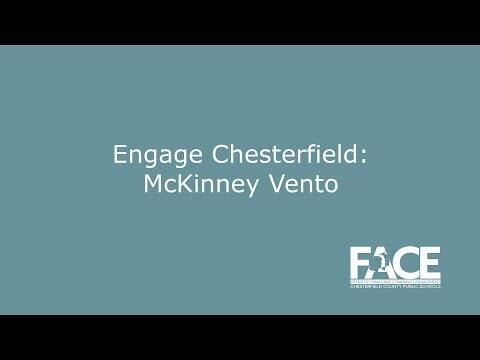 Who is Eligible Under The McKinney-Vento Act? Sharing the housing of others due to loss of housing, economic hardship or a similar reason. Living in motels, hotels, trailer parks or campgrounds due to a lack of alternative adequate housing. Living in an emergency or transitional shelter. Living in a car, park or public place not meant for habitation. A child or youth not living in the physical custody of a parent or legal guardian due to incarceration or death of parent or because the youth has run away. Enroll in school immediately, even if you do not have all of the required documents. Attend classes while the school gathers needed documents. Enroll in the local school or continue attending the school of origin (the school attended when permanently housed or the school in which the student was last enrolled). If the school district believes that the school selected is not in the best interest of the student then the district must provide you with a written explanation of its position and inform you of your right to appeal it’s decision. Transportation to and from the school of origin if requested. Educational services comparable to those provided to other students, according to the students needs. Free school breakfast and lunch and school fee waivers. 2740 Bensley Commons Blvd, N. Chesterfield, VA 23237. Call 780-0840. Hours: Monday— Tuesday, 9:00am – 8:00pm; Wednesday—Friday, 9:00am— 6:00pm. Accepts insurance, Medicaid, Medicare & uninsured. Child Health clinic services are provided for Chesterfield County residents ONLY. Private insurance is not accepted. Families must bring proof of residency and income information to the appointment. Spanish-speaking translators may be available. Kindergarten entry physicals are provided in August. New Patients call 521 -8263. Downtown: 108 Cowardin Ave (233-5016). West: 8600 Quioccasin Rd (622-0803). The Governor’s Access Plan (GAP) is a program that integrates primary and behavioral health services and coordinates care for Virginia’s uninsured adults with serious mental illness (SMI). Other key benefits include diagnostic, and laboratory services, as well as coverage for prescriptions. To apply of for more information please call 1-855-869-8190. The first step to becoming our patient or client is to register to see if you qualify for services. Call (804) 358-6343 to schedule a registration appointment. Or visit http://www.healthbrigade.org/ for more information. Located at 1200 W. Washington St., Petersburg, pathways offers medical care and supports for families at or under 200% poverty. Contact Ron Thompson, 804-862-1104 ext. 301 for more details. Located at 8000 Brook Rd, Richmond, VA 23227. Appointments are available Monday – Friday, 8:30 a.m. – 4:30 p.m. To schedule an appointment, please call 804-612-7065. Text “HOME” to 741-741. National Suicide Prevention Lifeline at 1-800-273- TALK (8255). Intake (804) 748-7318 . Call to access mental health or substance use disorder treatment. Same Day Access Walk- in is available: Monday 8am—2pm; Tuesday—Thursday 8am—4pm; Friday 8am—2pm. For more information regarding programs that support those with Mental Health, Substance Use, Intellectual Disability Services please call 804-748-1227. For programming and support that promotes individual, family and community behavioral wellness please call (804) 768-7212 or visit http://www.chesterfield.gov/MHSS.aspx?id=8590045210. For help navigating and accessing children’s mental health services in Virginia please call (804) 828-9897. For support groups, free education, and advocacy for all who live with mental illness and their families please call 804-285-1749 or visit http://www.namivirginia.org/. CALL 1-800-RUNAWAY. CLICK 1800RUNAWAY.org. TEXT 66008. SAMHSA’s National Helpline is a free, confidential, 24/7, 365-day-a-year treatment referral and information service (in English and Spanish) for individuals and families facing mental and/or substance use disorders. Please call 800-662-4357 for free, confidential help. Programs & support for LGBTQ+ Youth. (804) 644-4800. 2311 Westwood Ave. Youth Support Hotline: 888-644-4390. The Trevor Project: 1-866-488-7386. (for ages 13-24 LGBTQ+ youth in crisis). Parent Education Classes Whether it is getting to know your newborn or navigating your child’s “tween” years, these classes cover many “need to know” topics for parents and caregivers. All parenting classes, youth programs, and community education courses are facilitated by Prevention Services and open to all Chesterfield County residents. Chesterfield – Colonial Heights’ Positive Parenting Coalition mission is to educate, support, and empower families to achieve their full potential community collaboration and partnerships. The Autism Society Central Virginia (ASCV) provides direct services and supports in the following cities and counties in Central VA: counties of Chesterfield, Hanover, Henrico; and the city of Richmond. Down Syndrome Association of Greater Richmond advocates for awareness and understanding by educating their members and community about DS, and offering education practices to help our members navigate the school years – from IEPs to behavior and everything in between. The Down Syndrome Association of Greater Richmond provides services and information to families all over Central Virginia. Please call 804-447-4731 if you need help with: IEPs, behavior, waivers, educational support, aging of your loved one with Down syndrome and more! Resources for Independent Living, Inc. assists individuals with disabilities to identify and obtain the supports they need in order to live productive independent lives. The ARC of Virginia The Arc of Virginia promotes and protects the human rights of people with intellectual and developmental disabilities and actively supports their full inclusion and participation in the community throughout their lifetimes. Virginia Autism Council The Virginia Autism Council is a council of autism experts seeking to define needed skill competencies and to advance higher education, training and educational opportunities for personnel and caregivers supporting individuals with autism. Virginia Family Special Education is a one stop shop for families of children with special education needs to help access their child’s education system, connect to resources and learn their rights. Side By Side Youth Center Programs & support for LGBTQ+ Youth. (804) 644-4800. 2311 Westwood Ave. Youth Support Hotline: 888-644-4390. The Trevor Project: 1-866-488-7386. (for ages 13-24 LGBTQ+ youth in crisis). Access Chesterfield is a shared-ride transportation service for Chesterfield County Residents that aims to improve transportation services for older adults, people with disabilities, and individuals with lower incomes. Customers are required to schedule their rides at least one day in advance. Reservations may be made as early as 14 days in advance. Scheduling priority is given to medical appointments and work trips. Whenever Access Chesterfield references a work trip, it refers to paid work, not volunteer work. Visit http://www.chesterfield.gov/AccessChesterfield/ or call 804-706-2796 for more information and to see if you or someone you know qualifies. If you have Medicaid, transportation services are available by appointment only and is available 24 hours a day, seven days a week including holidays. To make an appointment please call: 1-866-386-8331. CommonHelp is Virginia’s convenient way to apply for healthcare coverage or to get help with food, child care, heating and cooling bills, healthcare and cash assistance. Please visit http://www.commonhelp.virginia.gov or call 855-635-4370 for assistance with application or more information. Veterans Crisis Line: Call 1- 800-273-8255 and Press 1. Text to 838255. For more information please call 804-786-0286 or 1-877-285-1299. A public/private partnership with the Commonwealth of Virginia, Virginia Navigator, and 2-1-1 Virginia, Virginia Easy Access provides supports for older adults, individuals with disabilities, veterans, families, and the providers that support them. Visit http://easyaccess.virginia.gov/ for more information.